Must call (856) 347-2858 to RSVP. Snacks and light refreshments will be provided. 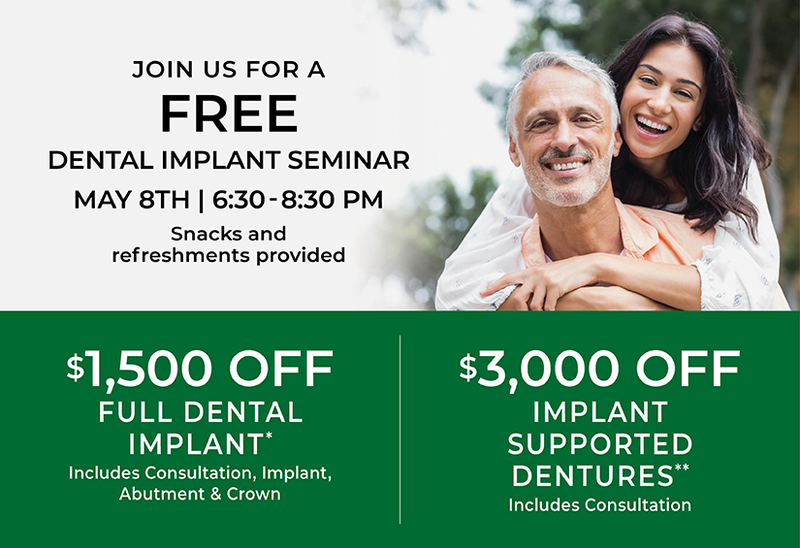 Come by our Dental Arts of South Jersey office and learn how dental implants can quickly improve your comfort, oral health, speech, ability to eat, and self-confidence. Replace missing teeth. Restore your self confidence. No Insurance? No Worries! Call (856) 347-2858 today to see what discounts are available. Must present offers to receive discount. Restrictions may apply. Treatment needs may vary by patient. Not valid on previous treatment or treatment already begun. May not be combined with any other offer, discount, insurance, or reduced-fee program. This offer cannot be extended to Medicare or Medicaid beneficiaries, or other recipients of federal or state health care benefit programs. Offers expire on 5/8/2019. *Includes exam, implant placement, healing screw, prefab abutment, and porcelain fused to noble metal crown. Custom abutments are additional. ADA 9310, 0150, 6010, 6199, 6056, 6058. Full value $3,598. **Price is per arch. Free initial consultation. X-rays and needed extractions not included. ADA 9310, D5110, D5120. Full value $4,998. Steven J. Reisman, DMD (General Dentist), Robin C. Windl, DDS (Prosthodontist, NJ Spec #5486), Gregory Lehnes, DMD FACP (Prosthodontist, NJ Spec #6126), John Nikas, DMD (Periodontist, NJ Spec #5766), Robert Mermer, DDS (Oral Surgeon, NJ Spec #4021).